And so we come full circle: When we last met author Leanna Renee Hieber during my interview with her, she was hot off a 2009 Prism Award win for DARK NEST, her futuristic fantasy novella. Now, she’s back aboard (yay!) 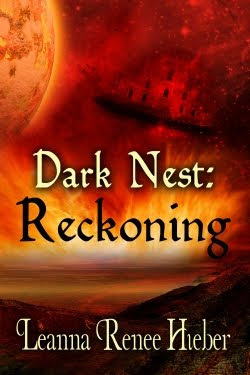 with news of DARK NEST: RECKONING, the sequel. 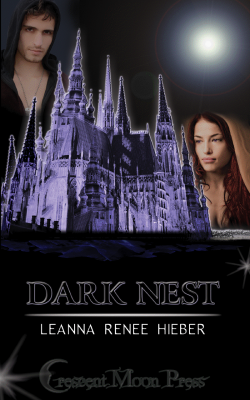 To help celebrate the release, Leanna Renee Hieber is giving away a signed, print copy of the first novella, DARK NEST (contest limited to U.S. residents). To enter, simply leave a comment for this post. The deadline to enter is Thursday, March 24 at 6 pm EST. So that you could learn more about this novella duo, I have a message from the author as well as an exclusive excerpt from DARK NEST: RECKONING. I’m a Historical Fantasy/Paranormal author. I’ve never claimed otherwise. But when author and best bud Isabo Kelly dared me to write a futuristic novella some years back, well, I love a good challenge. A Star Trek TNG, Battlestar Galactica and Doctor Who fanatic, it wasn’t a far cry for me to invent and fall in love with a futuristic world, and so I knew when I wrote Dark Nest that there were more facets to the story than I could tell in that novella format. When Dark Nest won the 2009 Prism Award in the novella category, I was further emboldened to make good on my promise to Crescent Moon Press and deliver the other side of the story that had been rolling around in my mind- even though I was neck deep in two deadlines for my Strangely Beautiful and new Magic Most Foul series of Gothic Victorian Fantasy / Paranormal novels. I’m glad I did, despite my difficult deadlines. I knew the Homeworld resistance had its own vital tale to tell, as well as providing a bit of closure on the genocide itself from a different heroine / hero perspective. These different perspectives are why the novellas couldn’t combine into one larger piece. I had an incredible time chewing on themes of tolerance, the difficulties of revenge, and the importance of hope and love at all costs. I hope you enjoy. Chief Counsel Ariadne Corinth has just found out her long-time lover, the powerfully gifted Chief Counsel Kristov Haydn, has died. Newly evolved psychically gifted humans have been sent by the Homeworld on a space mission aboard two distinct "Nests". Relationships between the Light Nest and the Dark Nest have faltered and Ariadne is sure there's something insidious behind it. In a matter of hours, Ariadne must find out what really happened to Kristov, unite her people to discover vast new powers the Homeworld denied them, or else submit to genocide. Captain Temesia Elysse has just steered her ship through almost certain death. With the help of her gifted crew, the Dark Nest has survived. Her newly evolved psychic people are targets of Homeworld genocide. Hundreds have been killed aboard the Light Nest. Back on Homeworld soil, her people are being hunted and she knows her lover may be dead, the gifted teacher Taryn Wolfe. It will take all Captain Elysse’s restraint, with vast new psychic powers available to her and her people, not to let anger get ahead of them. But there must be a rescue mission for those still alive. There must be justice. There will be a reckoning. And the Homeworld council has no idea their persecuted victims are alive, or just how powerful they’ve become. When tense, Captain Elysse sought physical release and had no qualms leaving the deck in the capable hands of her XO, Tseng. At eighteen years of age, he was an absurdly young man for such a post, but he was a certified genius with shockingly adept social skills. All she had to do was motion to him and she was off. She knew every inch of the ship. She’d lost track of how many times she walked to ease her tension. With a growing shame and horror, she wondered if she’d always known it would come to this, recognized the fears Brodin and Taryn had so ardently kept from her. As she walked, her booted footfalls satisfyingly firm and echoing along the smooth blue-steel corridors, the sturdy hem of her garment brushing the leggings fitted around her solid hips- she hadn’t much use for elaborate robes. Instead she chose dark tunics and sashes pinned with a winged insignia that denoted her as captain. She reached out her hand to caress bits of Gothic tracery and allowed memories to take their gripping stronghold. Temesia thought back to the first day Brodin had invited her to come tour the framework of the ship in the hangar. It was huge, silver, vast, Gothic, awe-inspiring and gorgeous. A shining blue-grey skeleton of a cathedral. Ancient and new, bulkily graceful and entirely impractical. She laughed out loud. It was so absurdly wonderful. The Homeworld had encouraged them to raise absurd amounts of money within their own population, encouraging them to be limitless. “Build the ship you envision for your future,” they said optimistically. Ironic that there was a crypt in the base level–as the Homeworld envisioned it to become their grave. She remembered standing there, staring, a grin on her face, as hundreds of Dark Nest candidates and high level students milled about, engineers and artists, visionaries and prophets. There was such excitement and joy as they created a temple to themselves, their art, their personalities and spirits. They could never have imagined, then, that it would become a divisive tool. It was a work of art. They’d never envisioned it would be pitted against the Light Nest and their PA friends within. “She’s something else,” Temesia replied. “That’s what I say,” came a voice from behind. She turned her head to see Taryn Wolfe smiling at her. Had Brodin invited him too? Of course. They were study partners, why wouldn’t he be invited? Surely Brodin knew that she and Taryn had begun to be more than just studying partners… Brodin was as infamous a match-maker as he was a genius professor. “What would you say if she were yours?” Brodin asked Temesia, gesturing to the ship. Temesia bit her lip and her cheeks warmed as suddenly the gorgeous gothic shell paled in comparison to the blue-grey sparkle of her partner’s eyes-a color that matched the ship. It was all of a piece. Everything fit. She wasn’t shocked by this possibility, but registered it with a great and dawning weight. She’d known she was being preened for leadership, just not in what capacity. Captaining a ship was more daunting than it was exciting. But if she was ever going to be the leader she was expected to be, she needed to show it. Before Taryn could comment on knowing things intimately, he was led away by Brodin. But he kept his gaze on Temesia until the last, telling her what she’d known from their first conversation. She was the one for him. She turned again to the ship, looking from one beautiful thing to another, bit her lip, and knew this was the ship for her. Temesia came back to the present reality of a people in danger, her world no longer quite so beautiful and clear, but her duty never so focused. As she took the “ambulatory” path back towards the deck, fashioned to be like the circular walk along interior chapels in a cathedral, she glanced out a narrow, lancet window at the glowing blue-green sphere looming large ahead. The reason for the PA Nest travel, as had first been presented by Homeworld council, was two-fold: to examine comprehensive data concerning the PA mind and physiology in space, and second, to search for a new planet to replace the barren, burning Homeworld. It had been made into the most noble and sensible of pursuits and every month they’d sent their findings dutifully home. Except this month. When directives were coming from the Homeworld spewing propaganda to turn the Nests upon themselves, when Kristov survived an assassination attempt, Temesia had began to wonder if the planet ahead shouldn’t be their new home instead. Separate. Just what the Homeworld wanted, save for one detail, there were hundreds more of them alive than the Homeworld had intended. They moved towards this new planet with the general agreement that they could not go home again. Not unless they wanted a fight. Temesia wanted one and she was sure she wasn’t alone. But the fact was she hadn’t brought up the tricky subject of abject revenge for a vote. Though with their burgeoning powers they could likely wreak mighty and satisfying havoc, she wasn’t about to let anyone vote for it. At the end of the day, revenge wasn’t her first priority. Life was. If the Training School had indeed been hit as Kristov glimpsed in the Great Well of truth, she would make sure some sort of mission would return to gather whatever lives they could. And hopefully whatever Kristov had in mind would scratch the particular itch for a reckoning and still keep them true to their empathic truths. Along this ambulatory walk were statues, erected by votes from the Dark Nest populous. They were historical figures, religious figures, famous philosophers or artists. Patron saints, as it were.